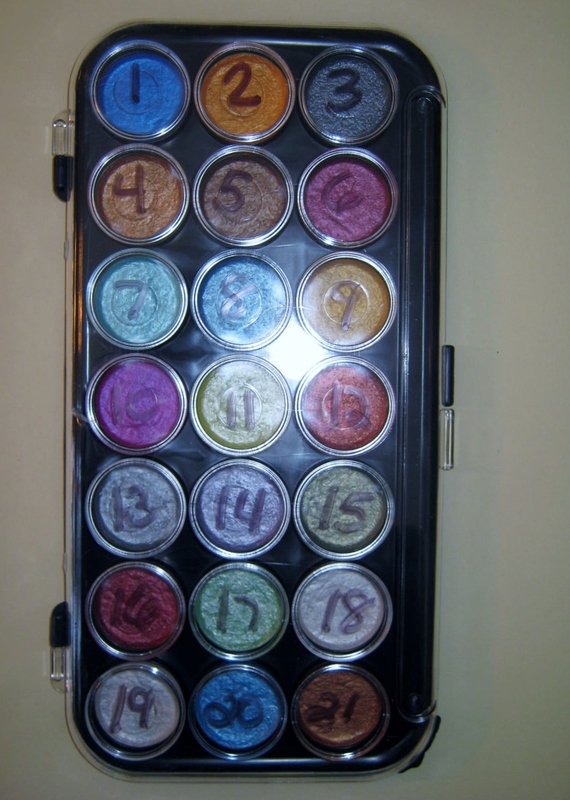 I found a new set of pearlescent watercolors this weekend. They are made by Yasutomo and available in craft stores and online. The set was less than ten dollars, and with the added benefit of a 40% off coupon, quite a bargain. I use Winsor & Newton watercolors, but am enchanted by the idea of adding a little touch of shimmer to a few of my more creative watercolor attempts. 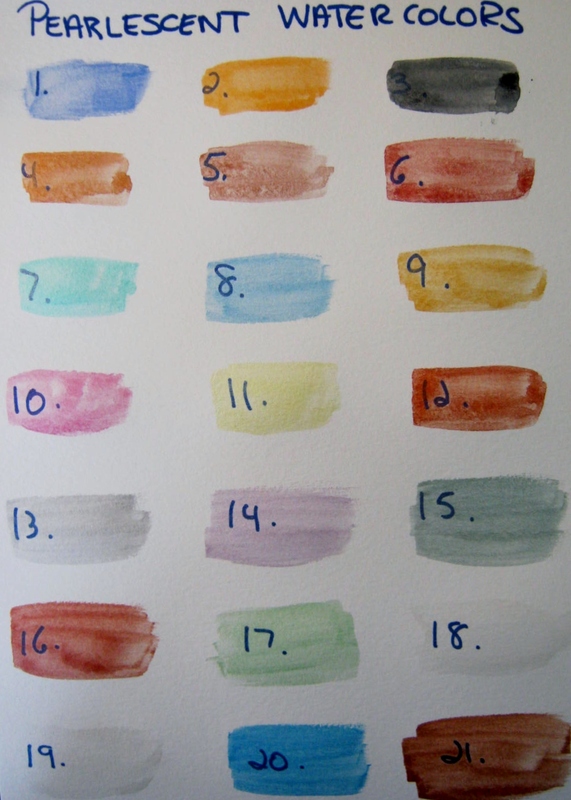 The first thing I did was number the paints and make a chart to see how the watercolors reacted on paper. They are very pearly and quite sheer. The permanent marker is easily seen through all the colors. I also experimented with a scrap of torn painting. 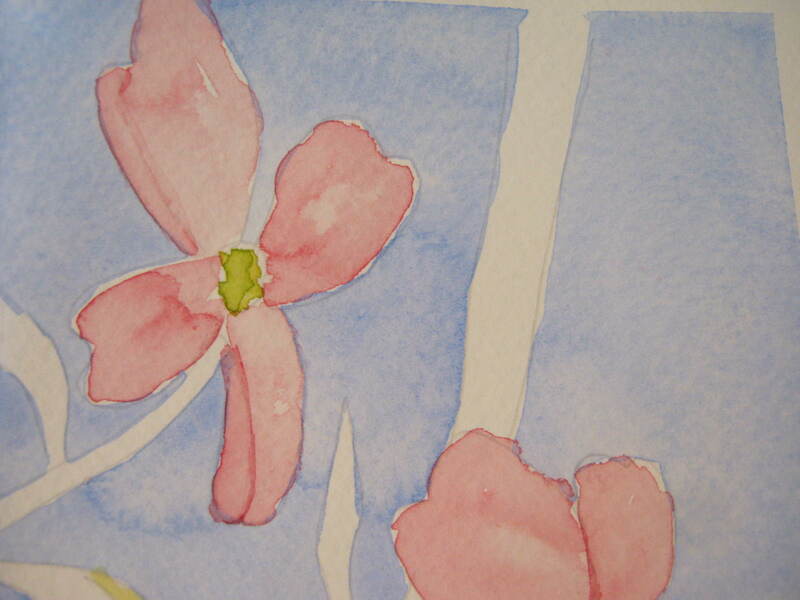 The pearlescent pink added shimmer to the petals, but still let the detail come through. 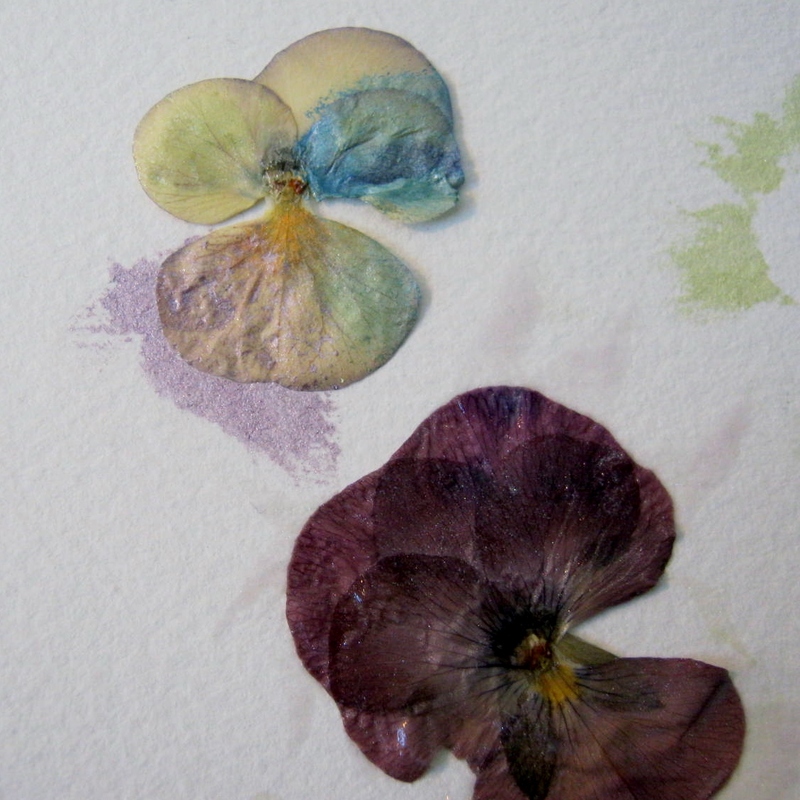 Another plus is the watercolors perk up the faded colors of old pressed flowers. These johnny-jump-ups were very drab, but the pearlescent paint added a bit of gleam and color. I can’t wait to experiment with this effect and will probably create a few greeting cards to have on hand. If you like to paint give these lovely watercolors a try. PostScript: I found these to be very hard in texture. Before using, add a bit of water to each pan. Allow the water to sit and loosen up the paint for a few minutes before you begin to paint. How beautiful the pressed flowers look with these new shades. Great work and great hobby ! Thanks Susie, I’ve pressed flowers for years. 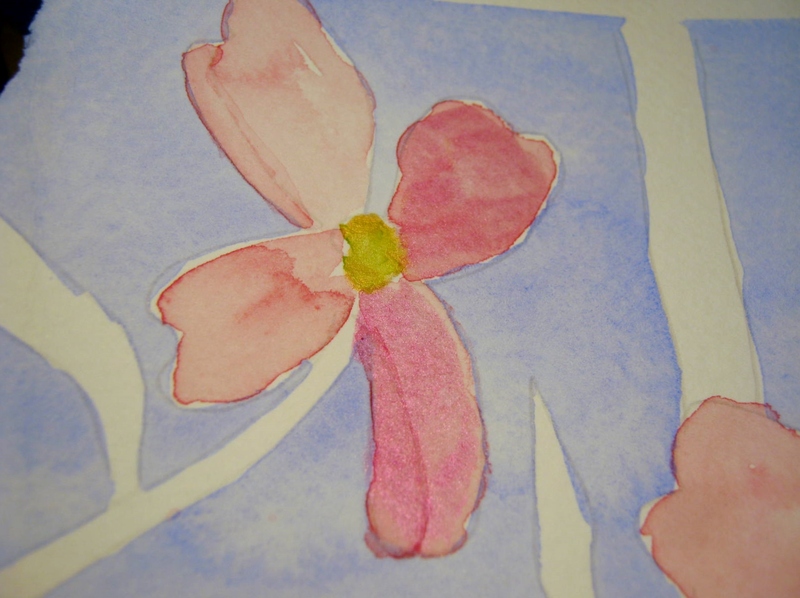 These older, faded flowers really perked up with the touch of pearlescent watercolors. Thank you for bringing beauty to ashes literally. 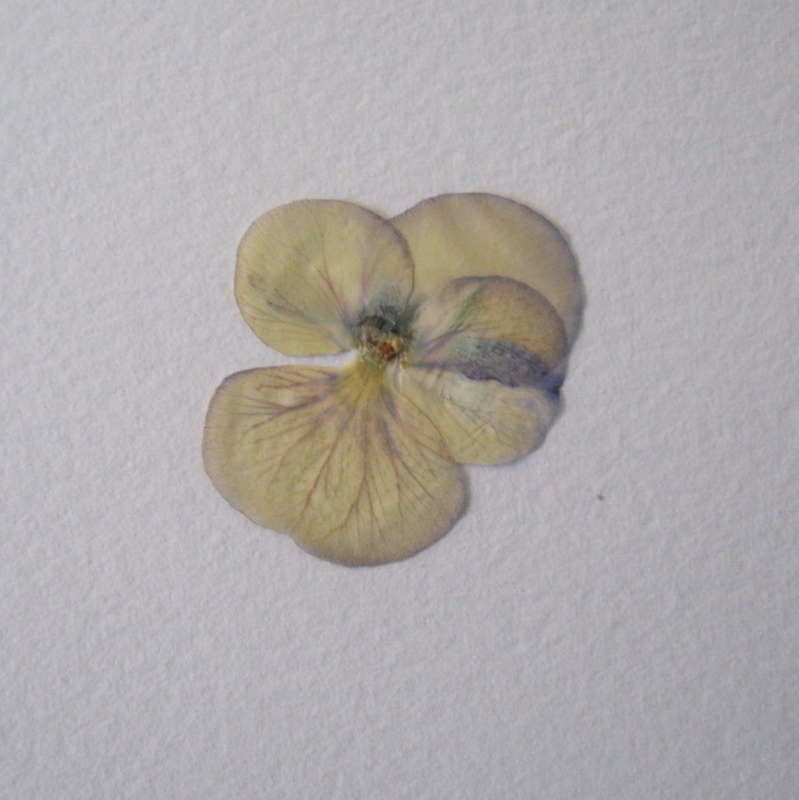 These little flowers have become works of art for posterity, I feel. so pretty… like for sure! 😀 Thanks for stopping by today…give them a try…they are very pretty. Wow loving the paintings, I was not built for water colours I think they are too delicate from my kind of art. One daY I might have a go. These colors look even yummier than the cupcakes that follow — and much less fattening!